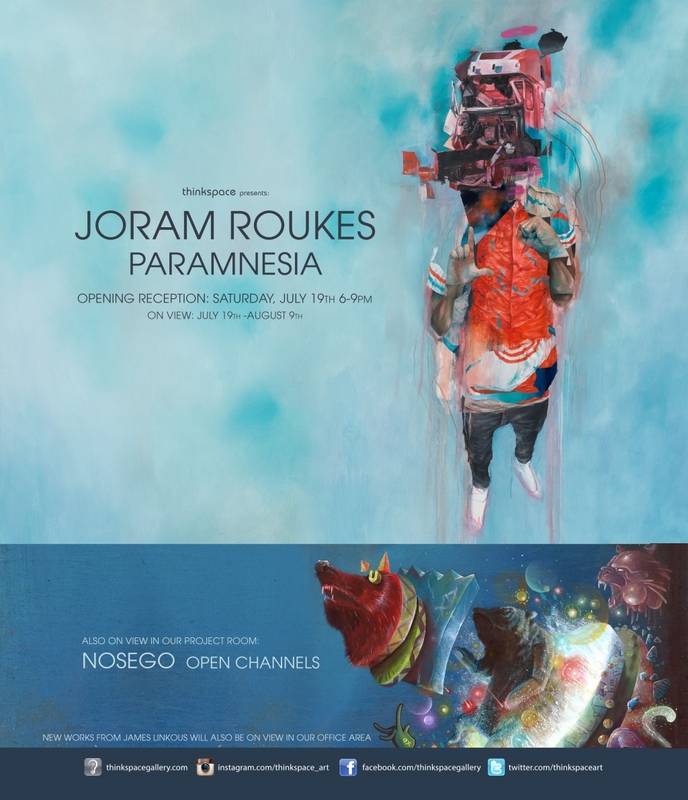 Concurrently on view at Thinkspace are new works by Philadelphia based artist Yis Goodwin, aka Nosego, in Open Channels. A highly accomplished fine artist, illustrator, and street artist, Nosego’s works are visionary. Simultaneously totemic and whimsical, the artist’s imagery seamlessly combines the flippancy and play of humor with the suggestion of an imposing, even mythically ancient, source of animalistic power. Imaginatively beautiful and strangely grotesque, Nosego captures a myriad of conflicting impulses in any single given piece. They are at once childlike and authoritative, huge and also small, playful and somehow cautionary, contemporary and arcane. His larger than life creations tend to reveal the smallness of their individual parts upon closer inspection. Imposingly excessive, and saturated with individual references, each piece presents a wealth of composited details and a host of minutiae to fascinate and entangle the viewer in endless readings. 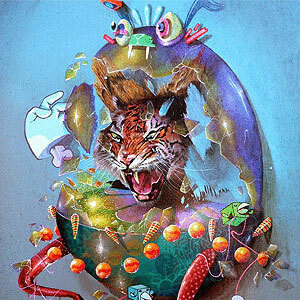 Nosego combines the animal with the suggestion of the human, and the illustrative with the realistic, to create beautifully disorienting hybrids. His works defy categorization, both stylistically and in terms of content, and are anything but reductive. They are polymorphous and in an unrelenting state of flux and metamorphosis: a dynamic perpetuity of becoming and undoing, as though they were living things. Nosego presents us with worlds that exist unto themselves, as illogical as they are seductive and transportive. The spontaneity of the artist’s huge imagination is at the fore of his practice. His works convey this feeling of explosive energy, as though looking into them provided the viewer with a direct conduit to the origins of their genius. With endless associative recombinations, and a genuinely uncensored creativity and penchant for experiment, the artist opens vistas unto worlds of unimaginable vastness, possibility, and intricacy. Nosego will be creating a site specific installation in the Thinkspace project room for Open Channels, and completing a public mural in Los Angeles in tandem with the exhibition.